I have a look from the vault to share with you tonight! This was from the beginning of fall last year when I finally picked up the full Maybelline New York Bleached Neons Collection. I love how bold yet softened the shades in this collection are. These were my "goodbye to fall!" nails and I'm excited to finally be able to share them with you. They make me think of fun and summer and the beach and the warmth - all things I definitely need to be reminded of during the chilly winter months! I started out with a base of Essie Blanc so my colours would pop, and then I did a layer of Maybelline New York Citrus Collide. After putting down a strip of zig zag vinyls from NailVinyls I painted segments with alternating shades of Coral Heat, Day Glow Teal and Ultra Violet. Finish it all of with some neon yellow studs from Born Pretty Store and some top coat and it's done! What about you, do you like to wear neons in the off-season or just during the hotter months? Beautiful! I love how the studs make everything look 3D. :) I regret not getting any of these neons. I loooove a good deep, warm green! 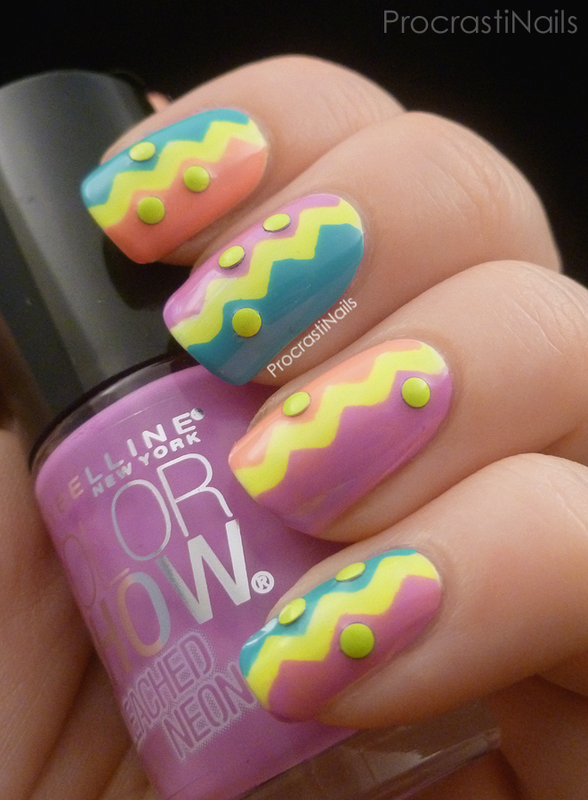 Those are some fun neon colors you used in this zig zag design. This is so happy - the studs are the perfect addition! Thank you!! They made me so happy to look at! This is cute! I don't stick to seasons, I wear neons year round. 90% of the time I stick to seasonal trends, but I really need to go off script more often. :) I forget how much I love neons! I LOVE this! Those Bleached Neons are really cool...I almost included a few on my favorites from 2014 list! Love these colors together! Though I personally would have left of the studs - the zigzag pattern doesn't need anything to make it prettier! I definitely regret not picking up the Bleached Neon collection! These colors are gorgeous! These are so fun!! I love the colors and the design!! This is such a fun look. Makes me think of warmer weather and fun times. The studs are a great addition. These are so cute and fun! 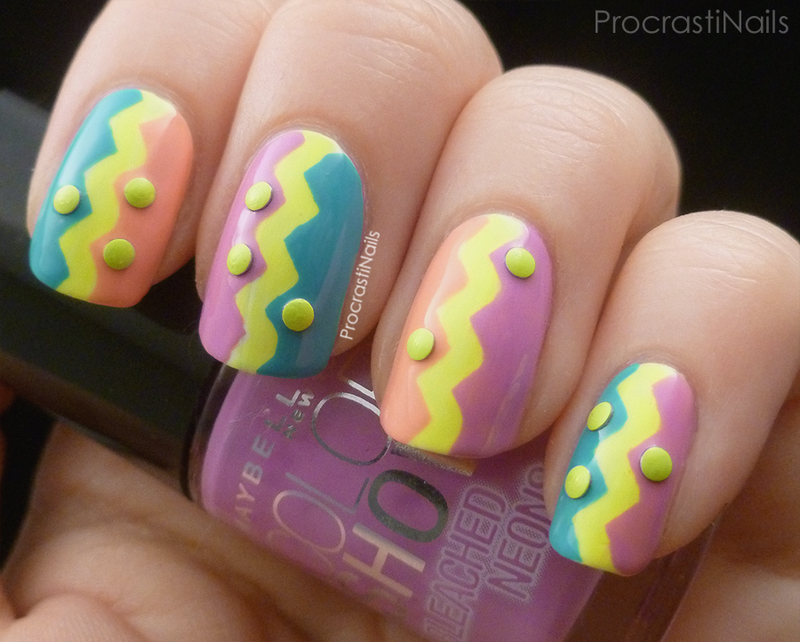 They kind of remind me of Easter eggs, haha :) I totally agree, bright nail colors can be a huge mood-booster! I love those colours - hope they make it all the way over here.